The government is all set to expand scope of Aadhaar linkage. All SIMs (mobile phone numbers) not linked with Aadhaar will be deactivated after February 2018, informed sources. The government has already mandated quoting of Aadhaar, the 12-digit Unique Identity Number (UID) issued by the UIDAI (Unique Identification Authority of India), for filing of income tax returns (ITRs) or applying for Permanent Account Number (PAN). It is moving ahead with linking Aadhaar with mobile SIM cards, the agency further said. That means mobile phone service users will have to link their Aadhaar numbers with SIM numbers. Telecom companies had been earlier instructing users to start the process of linking Aadhaar card with phone numbers. Many telecom operators have already started sending alerts to customers about completing the Aadhaar-SIM linking process. 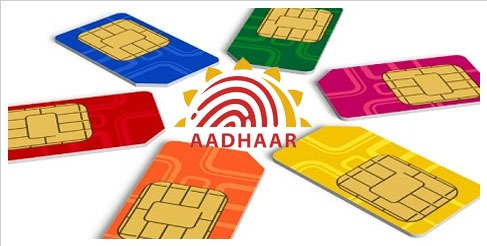 If you have opted for 'eKYC' - Aadhaar-based activation - by providing the biometrics while applying for the mobile connection, you do not need to go through the Aadhaar-SIM linking process again, Idea Cellular said. Other subscribers need to visit their nearest Idea outlets and follow simple steps to complete the mandated E-KYC process, the telecom company said. eKYC is an online method of providing details as per Know Your Customer norms. "As per the government directive, linking Aadhaar to your mobile number is mandatory for all existing customers," Bharti Airtel, the country's largest telecom operator, said on its website. Bharti Airtel also prescribed its prepaid and postpaid subscribers ways to achieve Aadhaar-SIM linking. To complete biometric verification, Airtel said customers having its postpaid connections are required to visit the nearest Airtel Store, while prepaid customers can do so by visiting their nearest retailer. "We recommend you complete this process as soon as possible. Last date for the same is 6th Feb 2018," Bharti Airtel further said on its website - airtel.in. Specifying the documents required for the process, Airtel said: "All you need is your Aadhaar card/number and your Mobile. You will be required to complete biometric verification. You will also receive the verification code (OTP) on your Mobile that would be required to complete the process." Idea Cellular gave four steps for its customers to link their Aadhaar with mobile number. Step 1 - Visit our nearest Idea centre and provide your mobile number and Aadhaar number. Step 2 - The Idea store executive will provide a four-digit verification code on your mobile from the re-verification application. Step 3 - The subscriber will then provide the verification code to the Idea store executive and provide his or her biometrics. Step 4 - After 24 hours, you will receive a confirmation SMS, reply 'Y' to complete the EKYC process. Many telecom operators have already started sending alerts to customers about completing the Aadhaar-SIM linking process. All SIMs (mobile phone numbers) not linked with Aadhaar will be deactivated after February 2018, informed sources.